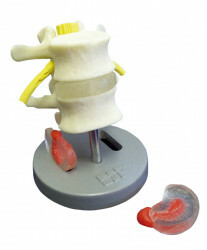 Purchase 50 or more Basic Anatomical Models and download your free support pack worth £100. Purchase 200 or more Basic Anatomical Models and you can have personalised covers absolutely free! 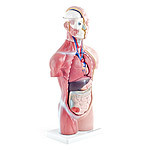 This basic anatomical model contains 18 pieces and represents the human head and torso with internal organs, blood vessels and muscles. The torso model is mounted on a sturdy plastic base and is hand-painted. The internal organs can be removed so that the kidneys, ureters, etc. become visible. The back of the torso model opens to reveal the spine, the rib primordia, the spinal cord and the foramen magnum. Muscles and tendons are recognisable on the right side of the torso, while the left side shows the skin.